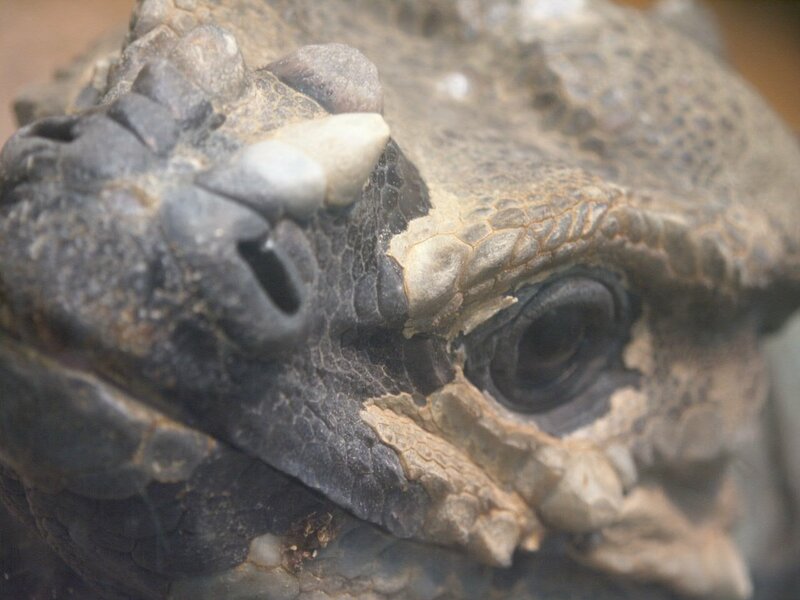 Physical Description The rhinoceros iguana gets its name from the outgrowths, like horns, on the end of its nose. It is a powerful lizard with a long tail. It is cold-blooded, like other reptiles, and must bask in the sun before it can become active. Dusky-grey or olive-green with dark cross bands that are often barely visible. There are three bumps on the snout. These bumps are more pronounced in males. The average size is about 2-2.5 feet in length. Because these animals live in such harsh environments they make extensive use of underground burrows, or dens, as retreats. These animals bask in the sun primarily in the morning and late afternoon using exposed lookouts. Shy, alert, and wary, Rhinoceros Iguanas retreat into their dens whenever disturbed or to escape the heat of day. Rhinoceros Iguanas are diurnal, only active during the day. Their breeding season is in April. During this time, females dig nest cavities in the sand, and can lay as many as 16 eggs!! 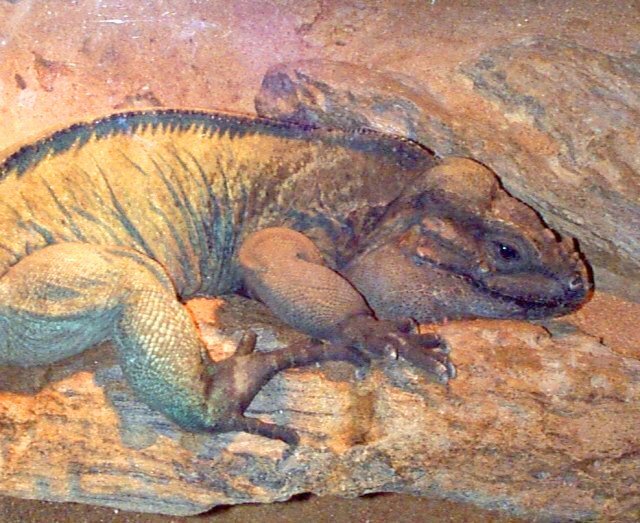 Among the most rapidly declining of the reptiles are the ground or rock iguanas of the genus Clyclura. These large, primarily herbivorous lizards are predominately dry habitats of the islands of the West Indies. Until the coming of man there were few large carnivores except boas and hawks, hence these lizards evolved in the relative absence of competition for food resources or major predators. Since the arrival of man and his domestic animals-dogs, cats, rats, goats, and pigs- and with the introduction of the mongoose to most of the large islands, there has been extensive predation on all the species, and today their populations are steadily declining in the face of man's intervention. Until the coming of man there were few large carnivores except boas and hawks, hence these lizards evolved in the relative absence of competition for food resources or major predators. Personal Observations While visiting the Fort Worth Zoo, the Rhinoceros Iguana was a very tame, and slow moving lizard. His color was a dirty green and was approximately 2.5 feet long. Sitting on his long branch, the horny projection dominated his face.